Carey Maynard-Moody, president of the Depot Redux group, says she is ready to celebrate the years of work that led to the completion of a $1.8 million renovation project on Lawrence's Santa Fe train depot, pictured Tuesday, Feb. 5, 2019, at 7th and New Jersey streets. The rededication event is set for Feb. 22, at the depot. For years, little attention was given to the blond brick building along the railroad tracks. Though it served as an active train station, the Santa Fe depot was poorly maintained, was often vandalized and was sometimes the site of illegal squatting and drinking. 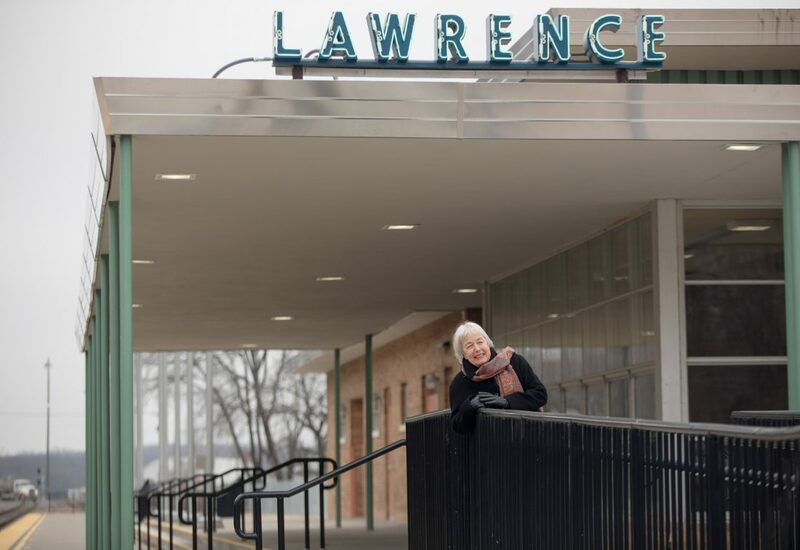 Then, more than 10 years ago, a group of Lawrence residents started taking care of the station — hosting cleaning days, ensuring its doors were open and locked at the correct times, and sometimes having musicians play on the platform to greet passengers. But above all, the group, Depot Redux, was advocating that the City of Lawrence take ownership of the building so that needed repairs could be made. “We spoke on behalf of this little orphaned train station,” said Depot Redux President Carey Maynard-Moody. 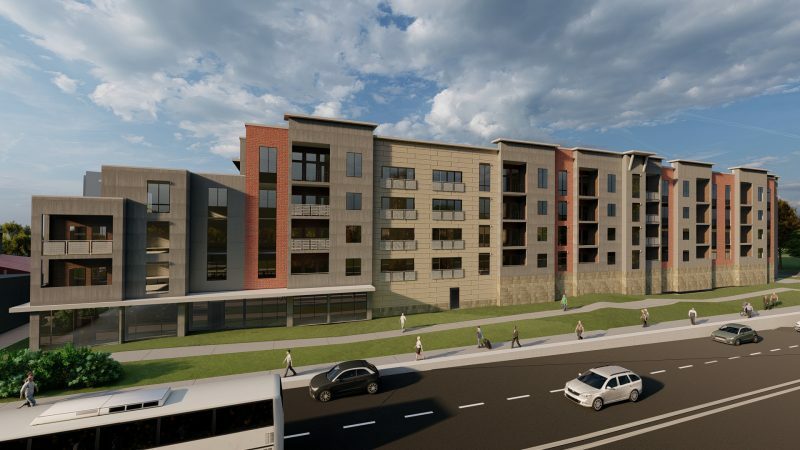 Maynard-Moody said those involved had different reasons for supporting the project, with members of the group including train buffs, fans of the building’s midcentury modern architecture and folks from the surrounding East Lawrence neighborhood. But Maynard-Moody said what they all wanted was to bring attention to the station’s limited care and possibilities for its future. Ultimately, the group’s advocacy paid off, and after years of effort, an approximately $2 million rehabilitation of the station is complete and the city is preparing to rededicate the historic Santa Fe depot at a ceremony later this month. Lawrence’s newly renovated Santa Fe train depot is pictured Tuesday, Feb. 5, 2019, at 7th and New Jersey streets. The Burlington Northern Santa Fe Railway previously owned the station and donated the building, excluding the property underneath, to the city in 2017 after negotiating a contract with the city. Amtrak uses the station for its Southwest Chief route, qualifying the city to receive federal and state grants to improve the building. 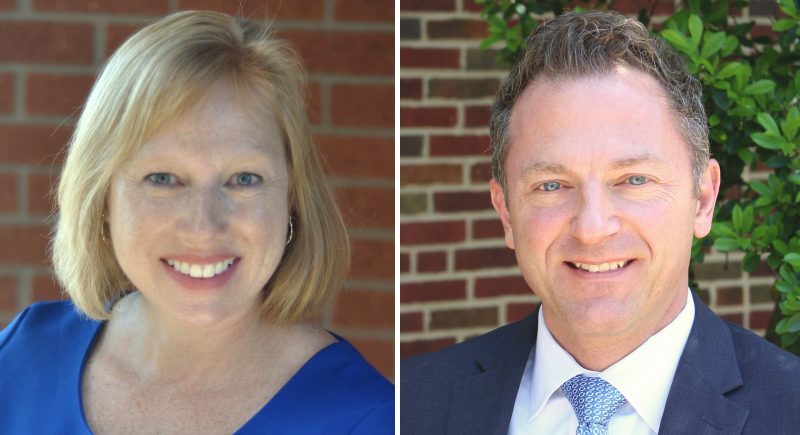 After failing to win three grants, the city continued its applications — with letters of support from Depot Redux — and ultimately won two grants that covered about 80 percent of the costs to plan the project and rehabilitate the building, Assistant City Manager Diane Stoddard said. 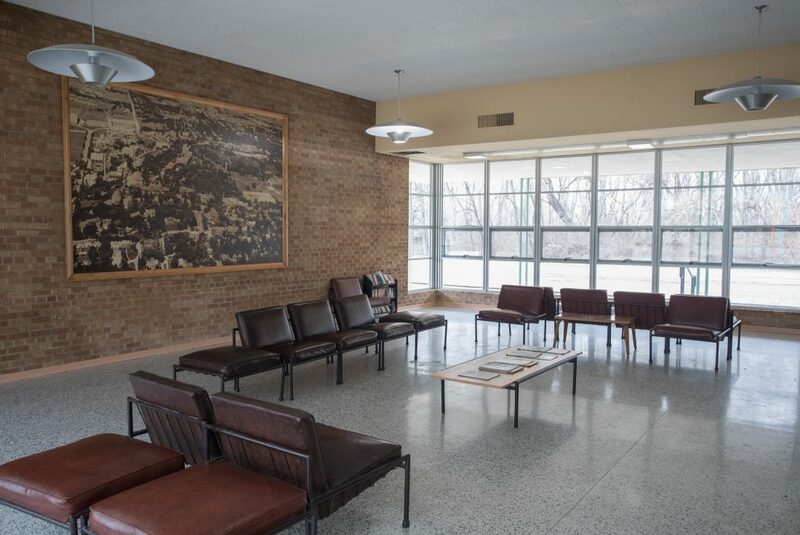 The one-story brick station, which was built in the 1950s, is an example of midcentury modern architecture and is now listed on both the state and national registers of historic places. Midcentury features of the building include its strong horizontal lines, overlapping flat roofs and a wall of windows that wraps around one of the building’s corners, according to a building description by local architectural historian Dennis Domer, also a member of Depot Redux. 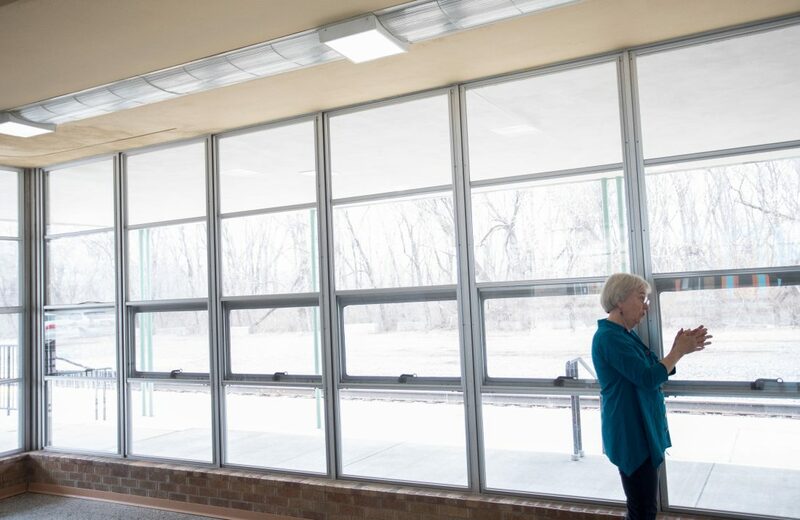 Carey Maynard-Moody, president of the Depot Redux group, stands in front of a wall of original windows overlooking the train tracks on the east side of Lawrence’s newly renovated Santa Fe train depot, Tuesday, Feb. 5, 2019. The windows in the second row from the bottom have rounded corners and are styled much like the windows on Amtrak trains, which stop at the station. The historic status and rehabilitation ensure that the station’s architecture and design, from the aluminum fascia trimming the roof to the interior’s flecked terrazzo floors, will endure. As part of the rehabilitation, project architect Stan Hernly said they matched various materials in order to make repairs: the mixed-yellow brick for the exterior, the textured white tiles for the ceiling and thick clay tiles for the bathroom, including made-to-order pieces from the lone company that still makes them. Hernly said they were even able to match the original minty green and salmon-colored paint for the interior walls after discovering the original shades by removing baseboards. Storm windows were added in such a way that they didn’t obscure the rounded corners of the windows, which mimic the train windows from the era. The rehabilitation continued on the building’s grounds, as well. Hernly said some exterior features that actually date back to the original train station, which was built in 1883 and demolished in 1955, were also restored as part of the project. Those include the brick parking lot to the west of the building and a nearby fountain that once served as a watering trough for horses. 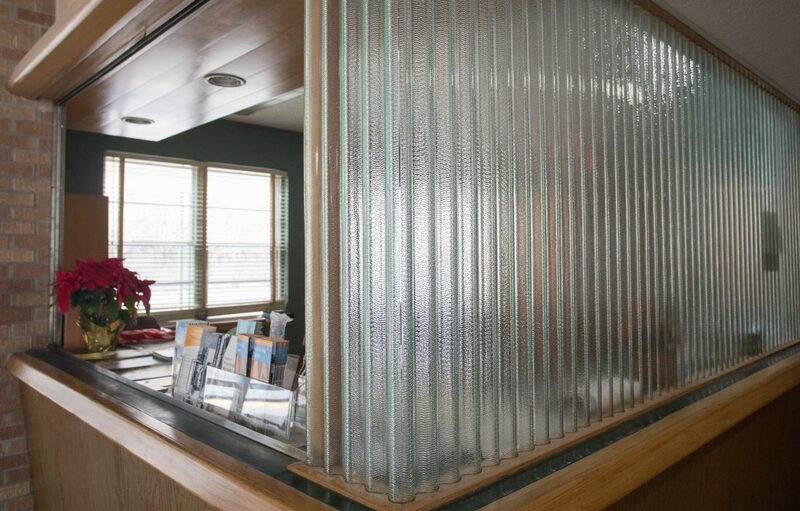 Original style wavy glass, located around the ticket and information desk at Lawrence’s Santa Fe train depot, is seen Tuesday, Feb. 5, 2019, following the completion of a large renovation project at the station. 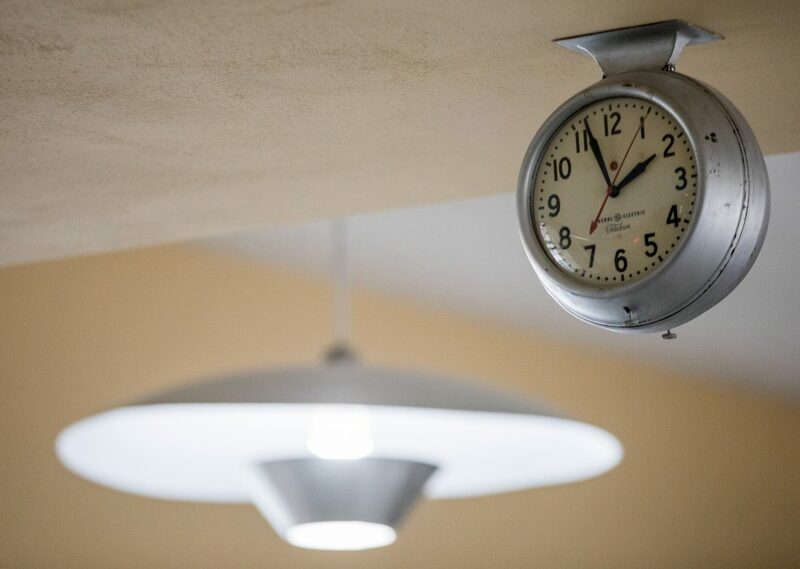 An original lobby clock and ceiling lights were kept as part of a multi-million dollar renovation to Lawrence’s Santa Fe train depot, pictured Tuesday, Feb. 5, 2019. 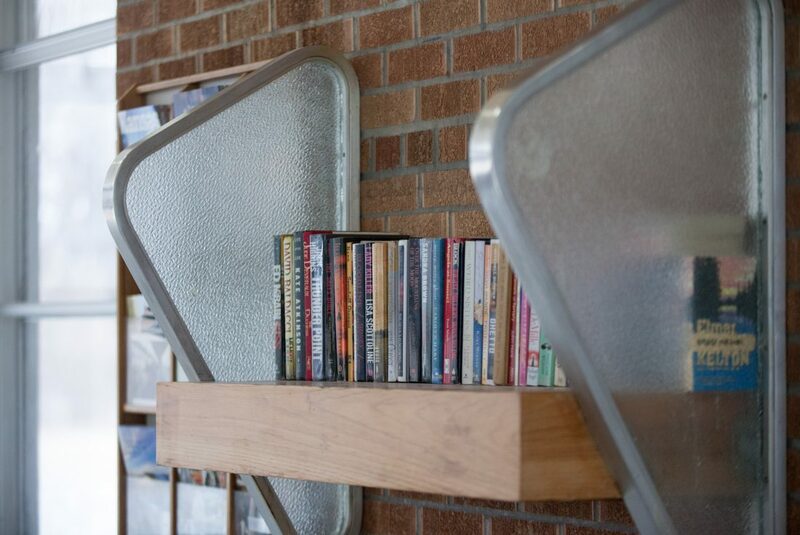 A used book kiosk made from pieces of an old phone booth at Lawrence’s newly renovated Santa Fe train depot is pictured Tuesday, Feb. 5, 2019. 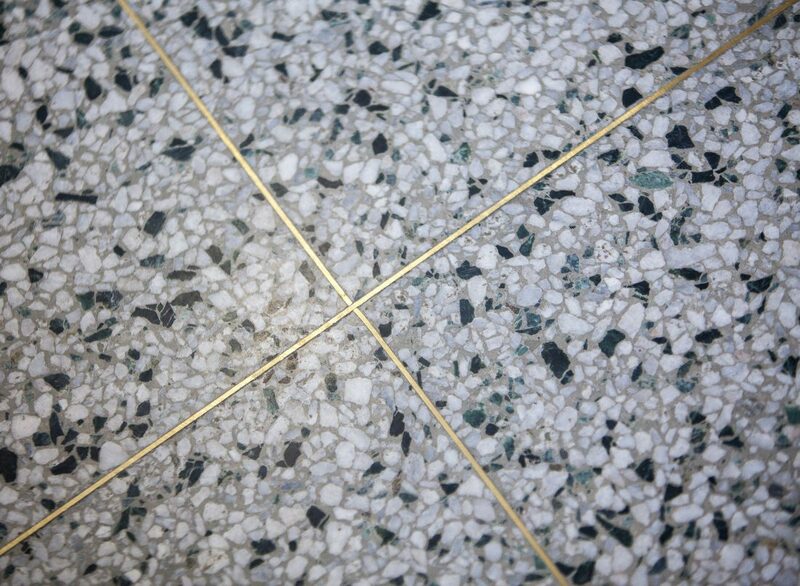 Original Terrazzo floor tiles are seen throughout the lobby of Lawrence’s newly renovated Santa Fe train depot, Tuesday, Feb. 5, 2019. 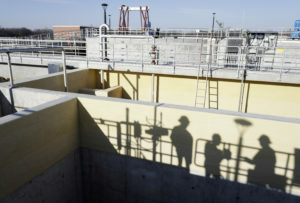 The rehabilitation also repaired various structural and mechanical components of the station, such as its roof and the heating and cooling system, including an under-floor heating system, according to Stoddard. Additional installations included a new geothermal system and solar array on the roof. 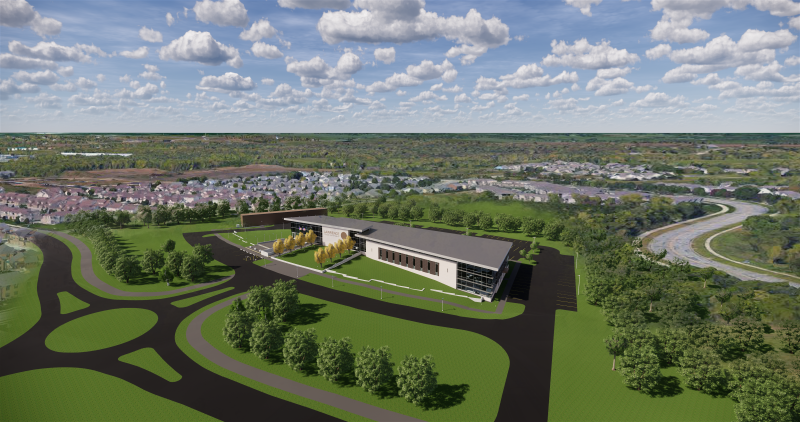 “It’s kind of a neat story that we have a historic building with these really cutting-edge energy features in it,” Stoddard said. Amtrak also funded improvements to the entrances, bathrooms and other features to bring the building in line with the requirements of the Americans with Disabilities Act. The effort to establish a daytime use for the building, which is only used as a station during the train’s two daily stops at 11:49 p.m. and 5:09 a.m., is still ongoing. A large renovation project at Lawrence’s Santa Fe train depot has preserved much of the interior, including artwork, furnishing, lighting and architectural features. The lobby at the depot is pictured Tuesday, Feb. 5, 2019. 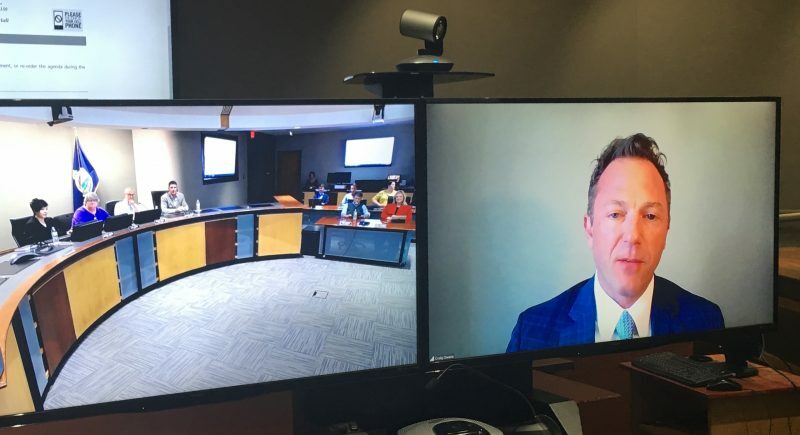 Stoddard told Lawrence city commissioners last month that there could be long-term commercial uses, such as a coffee shop, bicycle repair shop or other business or service, that could be compatible with the need to maintain the lobby for passengers. Commissioners agreed to allow temporary rentals of the building and to put out a call for proposals for other, more permanent ways to use the space. However, those potential uses are dependent on an ongoing negotiation of the agreement between the railway and the city. One provision of the agreement is a so-called “lease-back” provision that gives the railway the right to lease two of the station’s backrooms from the city with only 10 days of notice given. Stoddard said that discussions about changing or eliminating that provision so the city could make full use of the building were ongoing and that she was optimistic the provision could be changed. Maynard-Moody said that being able to have a second use for the building was also important to Depot Redux. 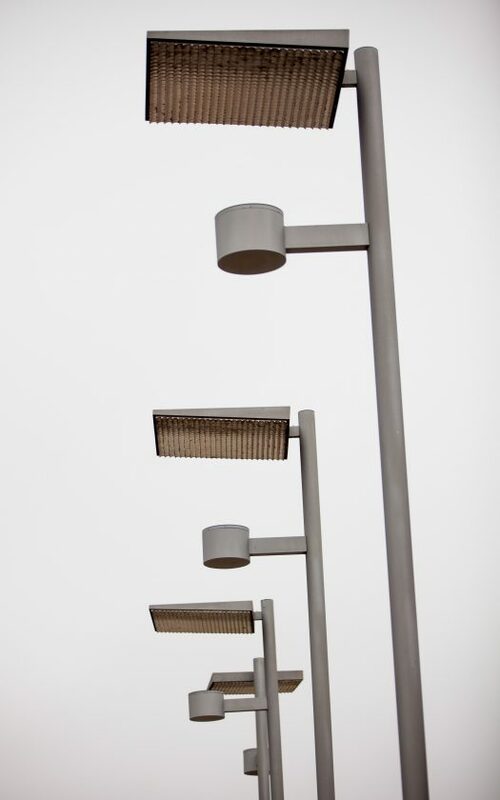 New exterior lighting near the tracks at Lawrence’s Santa Fe train depot are pictured, Tuesday, Feb. 5, 2019, following the completion of a large renovation project at the station. 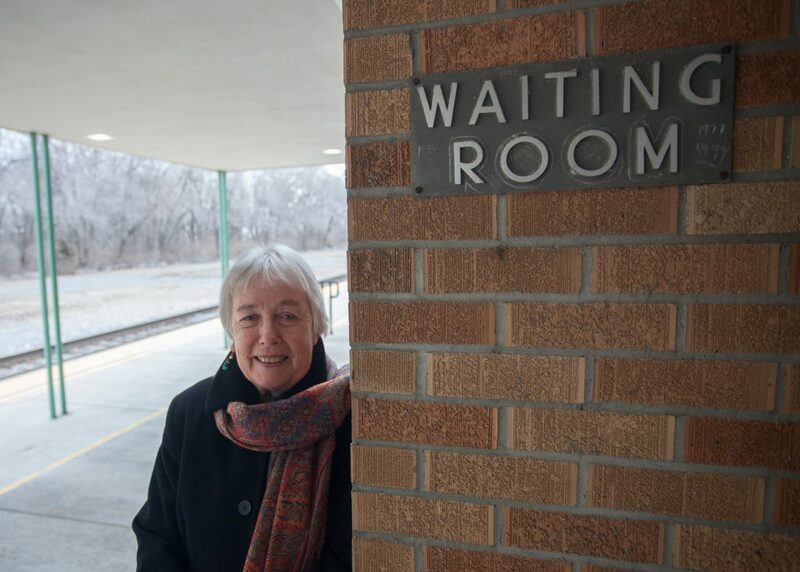 When asked about her thoughts on the time frame of the group’s efforts, Maynard-Moody laughed as she recalled that when Depot Redux — “redux” means to bring back — started in 2008, she thought it might take a couple of years for the city to arrange to take ownership of the station and win grants to get the repairs made. But through those years, the group stayed active. For eight years, Maynard-Moody said members of the group joined other volunteers in cleaning the depot monthly, including mopping the terrazzo floors and washing the walls of windows that flank the lobby. Group members served as volunteer caretakers, opening the building for late night and early morning riders, and also hosted celebrations each May for National Train Day from 2010 to 2014, as well as orchestrating what they called “on time performances,” in which musicians played live music Friday evenings as the midnight train arrived at the station. 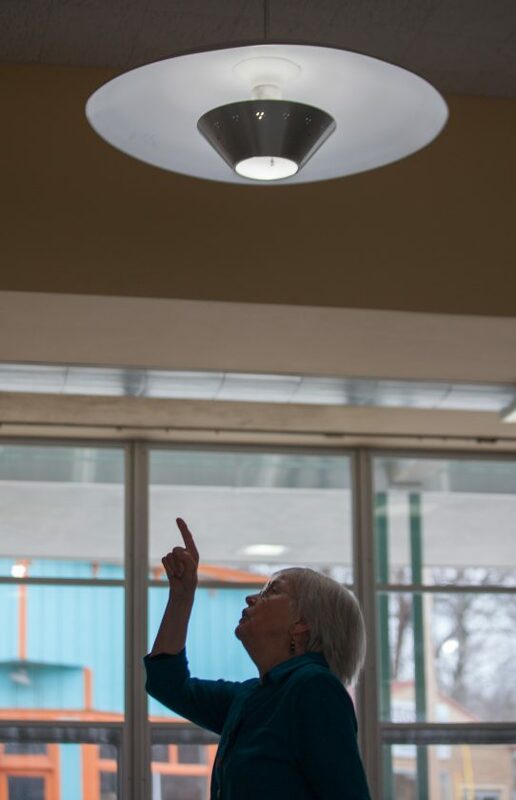 Carey Maynard-Moody, president of the Depot Redux group, points out original light fixtures inside Lawrence’s newly renovated Santa Fe train depot, Tuesday, Feb. 5, 2019. 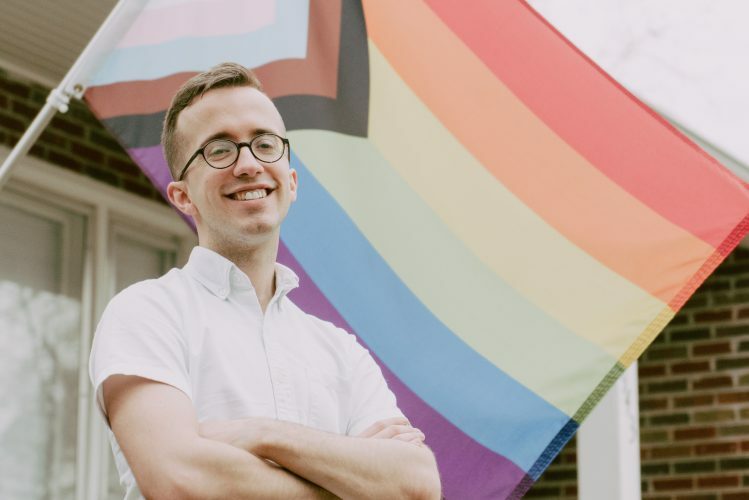 She said that, especially with the monthly cleaning days, the group’s appreciation and sense of ownership of the building grew, and their purpose extended beyond advocacy. The rededication ceremony for the Santa Fe depot will include speakers who have been involved with the project, including the original architect Warren Corman, and will take place at 4 p.m. Feb. 22 at the depot, 413 E. Seventh St.
Carey Maynard-Moody, president of the Depot Redux group, says she is ready to celebrate the years of work that led to the completion of a $1.8 million renovation project on Lawrence’s Santa Fe train depot, pictured Tuesday, Feb. 5, 2019, at 7th and New Jersey streets. The rededication event is set for Feb. 22, at the depot.